What do tourists do? They see sights. Okay, not everyone spends their time abroad checking out sights, but most do. Whether you are a pop-cultural sightseer or want to chill out and watch historic or otherwise magnificent stuff, Kyrat will not disappoint. Deep, claustrophobic caves. Tall, snowy mountains. The himalayan pearl offers great photo opportunities all over the place. Wait, what? 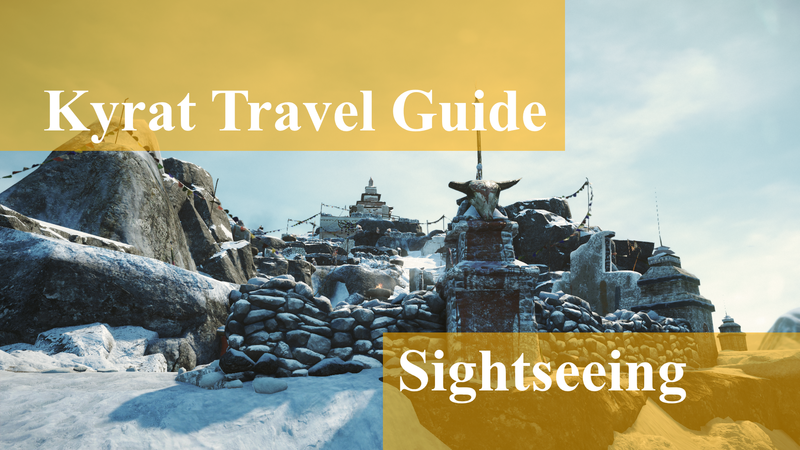 This isn’t a Skyrim travel guide… Oh, wait again. This is actually Chuck Testa Kyrat. Diverse surroundings you will find. One of the most famous landmarks in Kyrat. The Sleeping Saints (or sleeping saint, and forever sleeping saint, due to recent events). Jalendu Temple. A towering structure standing alone on an unreachable island (unless you have a boat, then it is totally doable). Shangri-La, if location were a psychedelic, Shangri-La is the place. You have to take a drug to get there, but boy is it fun. You can jump from literally everywhere and not get hurt. Another hard-to-reach place is a fortress high, high up in the himalayan mountains, The Temple of Yalung. It is inhabited by some “off” individuals, and you have to walk a billion steps to get there, but it’s worth it. Strolling around aimlessly may reveal some interesting murals and carvings, usually found in caves. Shanath Arena. I say, day b’ cray cray. Nature in itself is a sight to be seen, and worthy of a photograph. You’ll find plenty of motives for your living room wall here. There is much to marvel at. Natural or manmade, each of them surpasses each other in beauty the more you study them. The wonders of Kyrat should not to be missed. One sight you won’t be able to see is the golden statue of Pagan Min. It was destroyed by hooligans or something. Having only had beer as drinkable fluid for two days, the details around this is a bit blurry. Here lives the owner of the statue. The people guy in power. Pagan Min. Naw, just kidding. Here it is. Majestic, isn’t it? Kyrat is a land of spirituality, so if you want to do some sightseeing, while filling up your spiritual pool, there are places to do that as well. And then there’s this weirdo. He’s probably not dangerous, but keep a distance. Just in case. This will serve as a suitable segway to the next article. Delve into the spiritual side of Kyrat.